DocsCite (Arizona State University Libraries) helps with both MLA and APA styles. Govinfo provides free public access to official publications from all three branches of the Federal Government. and is the replacement for FDsys, More than just a website, govinfo provides an advanced, metadata-powered search experience, and includes a content management system and a standards-compliant preservation repository. The finding tool for federal publications that includes descriptive records for historical and current publications and provides direct links to those that are available online. The HSDL collection provides quick access to important U.S. policy documents, presidential directives, and national strategy documents as well as specialized resources such as theses and reports from various universities, organizations and local and state agencies. The resources are reviewed and selected by a team of homeland security researchers and organized in a unique homeland security taxonomy. HSDL content includes state-of-the-art multi-media offerings and other valuable assets identified by CHDS master's degree participants and instructors. Published annually by the Federal Government since 1878, The Statistical Abstract of the United States is the best-known statistical reference publication in the world. When the Census Bureau announced in 2011 that due to budget constraints they would cease to produce this resource, ProQuest took on responsibility for updating and releasing it. Both an answer book and a guide to statistical sources , Statistical Abstract is a comprehensive collection of statistics on the social, political, and economic conditions of the United States. Index to government sponsored research reports and technical papers from all areas of physical, life and applied science. Some more general databases often include government information, articles about the government and how it works, and sometimes reports from government agencies and Congress as well. Here are some you may wish to try. Academic Search Premier provides full text for nearly 4,600 scholarly publications, including full text for more than 3,500 peer-reviewed journals. Coverage spans virtually every area of academic study and offers information dating as far back as 1975. This is the fourth edition of Historical Statistics of the United States. The U.S. Bureau of the Census published the prior editions in 1949, 1960, and 1975, the last known as the Bicentennial Edition. Cambridge University Press publishes this, the Millennial Edition, with the permission of the Census Bureau. American State Papers, 1789-1838 enables students and scholars to easily search and browse legislative and executive documents of the first fourteen U.S. Congresses and more. This seminal set of U.S. government publications a rich source of primary material on wide-ranging aspects of early American history. Beyond, American State Papers is cross-searchable with the digital U.S. Congressional Serial Set and all other Readex Archive of Americana collections. The single most important series of American government publications, the U.S. Congressional Serial Set is an incomparably rich, largely untapped collection of primary source material on the people, issues and events of American history and politics. Readex's digital edition of this national treasure—the Reports, Documents and Journals of the U.S. Senate and House of Representatives—is the most accurate and complete replica available. Access to bibliographic and full-text patent databases. This page is the starting point for the USPTO's free trademark database, which includes the full bibliographic text of pendingand registered trademarks. The Inter-University Consortium for Political and Social Research (ICPSR) located at the University of Michigan is the world's largest data archive. ICPSR acquires, processes and distributes social science data collected by government agencies and other researchers. The data holdings cover a broad range of disciplines. The Defense Technical Information Center serves the Dept. of Defense community as the largest central resource for DoD and government-funded scientific, technical, engineering, and business related information available. The Technical Report Archive & Image Library (TRAIL) is an initiative led by the University of Arizona in collaboration with CRL and other interested agencies to identify, digitize, archive, and provide access to federal technical reports issued prior to 1975. Founded in 1923, CQ Researcher provides original, authoritative reports on newsworthy social and political issues. Covering topics in public policy, law, civil liberties, international affairs, economics, health, education, the environment, technology, and more, CQ Researcher is renowned for its objectivity, breadth, and depth of coverage. How is a CQ Researcher report created? CQ Researcher's editors identify a topic to be investigated, then one of the experienced journalists conceives the report's broad outlines, formulating the key questions the report will seek to answer; reads background material; interviews a range of sources; synthesizes available information; and writes the report. The average time to complete a report is five weeks. The Congressional Research Service (CRS) is a division of the Library of Congress. They produce highly respected analytical, non-partisan reports on topics of interest to members of Congress. While it is not in their mandate to disseminate their reports to the public, there are a number of free and subscription sites where you can find CRS reports. You can also request copies from your Congressional Representative. This website from DemandProgress contains new Congressional Research Service (CRS) reports -- https://www.everycrsreport.com/. There are about 8,400 reports on the site, with more coming each week. Their reports come straight from Congress, there is no charge for access, and they make the reports available for bulk download. A great collection and very searchable but a long delay in posting the most current reports. 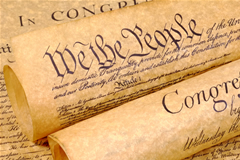 Included here are direct online links to many of the basic Federal Government documents that define the history of our democracy. Many are drawn from the GPO Access page Core Documents of Our Democracy (http://www.gpo.gov/libraries/core_docs.htm), though with several revisions and additions. They are included here as a service. A list of 100 milestone documents, with links to full text and images of the originals, compiled by the National Archives. These chronicle US history from 1776 to 1965. Includes such gems as the patent for the cotton gin; George Washington's farewell address; the notorious Supreme Court decision in Dred Scott v. Sanford (1857) that ruled that slaves were not citizens and could not expect any protection from the courts; the Zimmerman telegram (1917) that inflamed public sentiment against Germany and was instrumental in involving the U.S. in WWI; and the Voting Rights Act of 1965, removing barriers that were used to keep African Americans from voting. FedFlix (http://www.archive.org/details/FedFlix) is a joint venture between the National Technical Information Service (NTIS) and Public.Resource.Org, the creator of the web page archive WaybackMachine. Here are the best movies of the United States Government, from training films to history, from our national parks to the U.S. Fire Academy and the Postal Inspectors, all of these are available for reuse without any restrictions. iCivics (http://www.icivics.org/) is a web-based education project designed to teach students civics and inspire them to be active participants in our democracy. While meant for younger students, these games are fun and non-preachy way of learning a little bit about how all the branches of our government work together.